RED WING, Minn. – As part of its $500,000 investment in the Red Wing community, SpartanNash today celebrated the grand reopening of its newest Family Fare Supermarket, located at 615 Main St. The store, which previously operated under the Econofoods banner, underwent an extensive remodeling and rebannering process to better serve its store guests with an expanded product offering, including additional local items, selection, quality and freshness throughout the store. The renovation is part of SpartanNash’s overall investment in its Minnesota stores and local communities. The Northfield Econofoods underwent a simultaneous $3 million makeover, and the Litchfield location is also in the process of a similar renovation and rebannering, scheduled to be completed in October. In total, SpartanNash operates 85 Family Fare stores in six states. 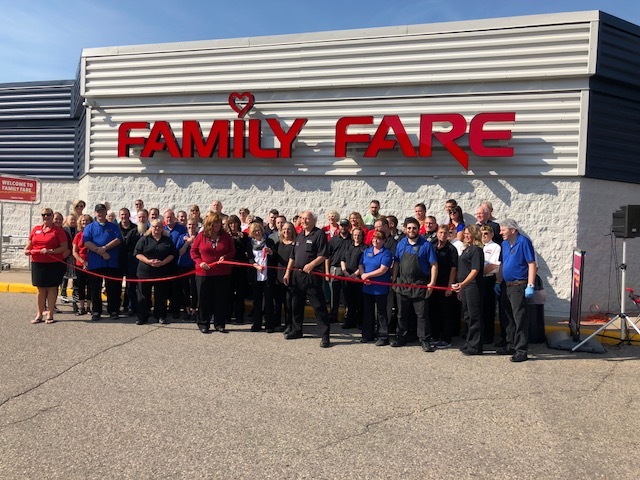 The Red Wing and Northfield Family Fare stores both celebrated their grand reopening today, with store guests and SpartanNash associates attending simultaneous ribbon-cutting ceremonies. The grand reopening ceremonies also kicked off a week of giveaways, food samples and surprise and delight offerings throughout each store. At the Red Wing ribbon-cutting ceremony, a pallet of food was donated to the Red Wing Area Food Shelf, in addition to donations to local fire and police departments. The transformation of the Red Wing Family Fare began in July, when it was reset to make it easier for store guests to navigate the perimeter and aisles. New signs, flooring and décor were also installed to update the interior of the stores, and the exteriors received a facelift. “We want to deliver a best-in-class experience with every trip to the grocery store, and our new and improved Family Fare will do just that,” Williamson said. “Our commitment to our customers will always be our top priority, and we appreciate their patience during this renovation. Our store associates have been and continue to be amazing during this conversion, and we thank them for their efforts throughout the remodeling process. In addition to the new in-store amenities, Family Fare store guests can now join the Fast Lane by easily ordering their groceries online at shopthefastlane.com and picking them up curbside. Orders placed at shopthefastlane.com are shopped by Fast Lane personal shoppers – who are also SpartanNash associates – who focus on selecting quality items from each aisle of the store. Store guests can also include notes for Fast Lane shoppers to follow, allowing them to make special requests like green bananas, near-ripe avocados and thick-sliced ham from the deli. Store guests with yes loyalty accounts will automatically have their preferences loaded into their Fast Lane account, making it even easier to clip digital coupons, select commonly purchased items or sort by department, sale items or dietary restrictions when placing an order. Annual and monthly Fast Lane memberships are also available at shopthefastlane.com to provide Fast Lane shoppers with additional savings.